There’s no better discovery at a yard sale than a table full of books. Especially if they’re Little Golden Books. I found myself in that happy situation when oldest grandchild Eli, now a big boy at age three-and-a-half, was just a toddler. At a random stop on Highway 127’s famed “longest yard sale in the world,” I hit the mother lode. Classic Little Golden books, priced at 50 cents apiece or three for a dollar. I quickly scooped up Tawny Scrawny Lion and Little Red Caboose. The Saggy Baggy Elephant. The Poky Little Puppy. The Little Red Hen. Scuffy the Tugboat. And my favorite of all—The Big Brown Bear. It was my lucky day for sure. Those eight books added up to three dollars. I might as well, I reasoned, pick out one more, since it would be free. 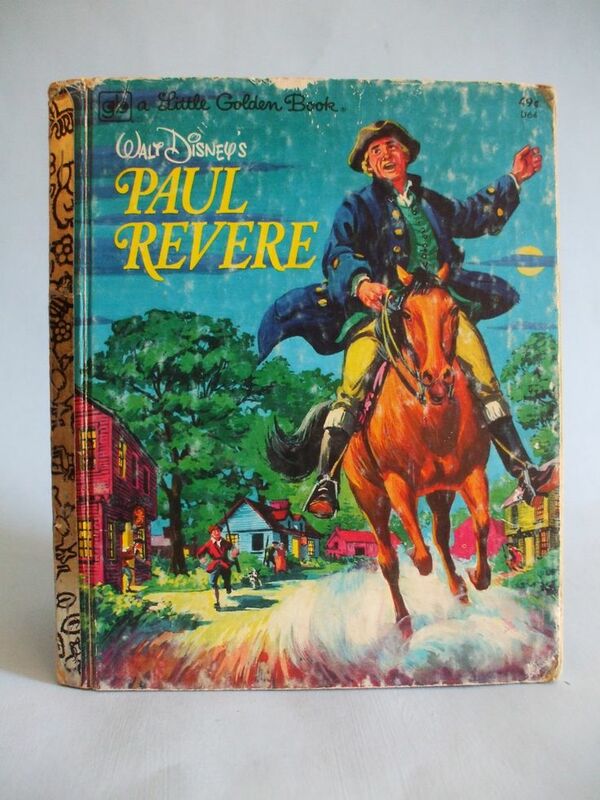 I soon spotted “Walt Disney’s Paul Revere,” published in 1957. 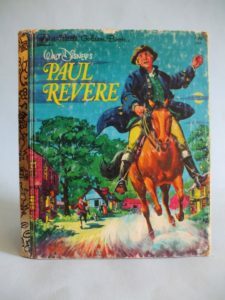 The blurb on the inside promised that “the story of Paul Revere’s ride for liberty is an exciting tale that all children will remember and love.” That was good enough for me, even though I was sure it was a book none of my grandkids would understand or enjoy until they were quite a bit older. Wrong. When I handed Eli the stack of books, it was the first one he picked out for me to read. “Are you sure, buddy?” I asked, reaching for Little Red Caboose. “Don’t you think you might like this train book better?” No. He wanted to hear Paul Revere. And he liked it so much he begged me to read it three more times. I did, of course, in spite of how long it was. As I tucked him into his crib that night, you know what he said? “To arms! To arms! The redcoats are coming.” I couldn’t stop laughing. It’s still a book Eli chooses whenever I’m at his house for a visit. When I read it to him just a couple of weeks ago, something wonderful dawned on me. This could be the subject for a newspaper column. And not just any old column—a Fourth of July column! Because of Paul Revere’s daring ride through the Massachusetts countryside in April 1775, the Minute Men knew to grab their muskets and to muster in the little village of Lexington to await the British army. Where, as we all know, the shot heard round the world was fired. Without Paul Revere, there might not have been a Declaration of Independence. No United States of America. July 4 would be just like any other day, here in the across-the-pond English colonies. That’s why this tattered Little Golden Book is so special. I know Eli likes the part of the story—probably more myth than truth–where Paul Revere ties a note to his dog’s collar and sends him home to fetch a pair of spurs. I know he likes the pictures of men in rowboats and of horses stumbling into swamps and of civilian soldiers pulling their long guns down from over the fireplace. He still loves saying “To arms! To arms!” But, even as smart as he is, I doubt he understands the concept of people not wanting to be ruled by a king. He doesn’t get why taxation without representation stuck in the American colonists’ craw. Heck, he probably doesn’t really understand the one-if-by-land, two-if-by-sea business. But someday he will. And I’ll be grateful to have been the one to help him learn why Americans celebrate Independence Day on the Fourth of July.